− 9 = 0 Required Please enter the correct value. Additional information about the highly anticipated Alibaba IPO was released yesterday (Monday) when the Chinese e-commerce giant updated its SEC filing – and some of the numbers tempered investor excitement. But there's actually a lot for investors to love. One concern stemmed from lower profit margin. Alibaba reported that its operating margin fell to 45% in the quarter ending March 31, compared to the 51% the company reported the previous year. The company attributed the decline to increased spending on marketing for its sites and for its mobile business. Likewise, revenue growth in the first quarter was 39%. That was down drastically from the 71% the company reported last year. The company is still growing, but the pace has slowed considerably. 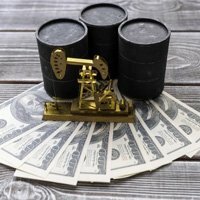 While those numbers caused some analysts and investors to pause, other important details were unveiled that were much more bullish. In the document, Alibaba officials answered the biggest remaining mystery since the company initially filed for a U.S. IPO back in May: the financials behind its two biggest websites, Taobao and Tmall. In 2013, Alibaba reported that Taobao handled approximately $177 billion worth of transactions, while Tmall handled $70 billion. By comparison, Amazon.com Inc. (Nasdaq: AMZN) handled $100 billion in transactions last year, while eBay Inc. (Nasdaq: EBAY) handled $54 billion. Alibaba also provided a look at its early 2014 numbers, revealing that transactions totaled $47 billion in the first quarter on Taobao and $22 billion on Tmall. Investors had also been curious about what the company's executive board would look like following the Alibaba IPO – and they got answers. The nine-member board will be led by Founder Jack Ma, Goldman Sachs Group Inc.'s (NYSE: GS) executive J. Michael Evans, and Yahoo Inc.'s (Nasdaq: YHOO) Jerry Yang. Yang had previously served on Alibaba's board from 2005-2012. It's common for companies to update their IPO filings and release more detailed information as their IPO date approaches. Once the U.S. Securities and Exchange Commission (SEC) reviews a company's F-1 filing, it will send back the document asking for revisions or clarifications. This is done so that global investors have as much information as possible before investing in the IPO. 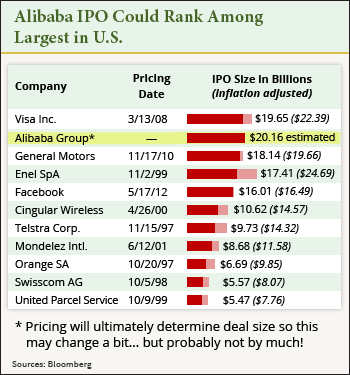 The Alibaba IPO in particular is drawing heavy interest because many analysts predict that it could be the largest U.S. IPO of all time. Some projections place the IPO over the $20 billion mark. Valuation estimates on the company have topped $160 billion, while some optimistic estimates top $200 billion. For example, Sanford C. Bernstein has valued the Chinese firm at an incredible $230 billion. Alibaba's revenue growth may have slipped in the most recent quarter, but the company still has a stranglehold on the Chinese e-commerce market. 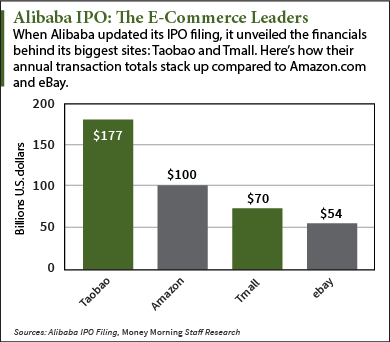 At the time of its initial filing, 80% of Chinese e-commerce took place on one of Alibaba's sites.